Eva with one showy queen. Cabbage, stoic cruciferous of the vegetable world, conjures bitter cold winters, patched-together woolens, and hardscrabble times. Through the centuries, the cabbage has been a mainstay, relied upon by civilizations to nourish themselves through winter, as hunger taps the frosted panes. You wouldn’t guess its humble roots at this time of the year. Literary prestige aside, at the Farmers Market, cabbage is the Belle of the Ball; Queen of the Sun reigning glorious in the garden. I grow cabbage as ornamental border plants, which provide color and texture to my autumn garden when the usual suspects — mums, asters, chrysanthemums — have lost their bloom. Decked in scalloped leaves nuanced in shades of purple and green, the cabbage’s leaves fan a tight nutritional globe. It’s a wonder, in fact, this showy beauty gives sustenance to civilizations, providing such nourishment. I’m always on the lookout for ways to incorporate healthy cabbage into my diet. 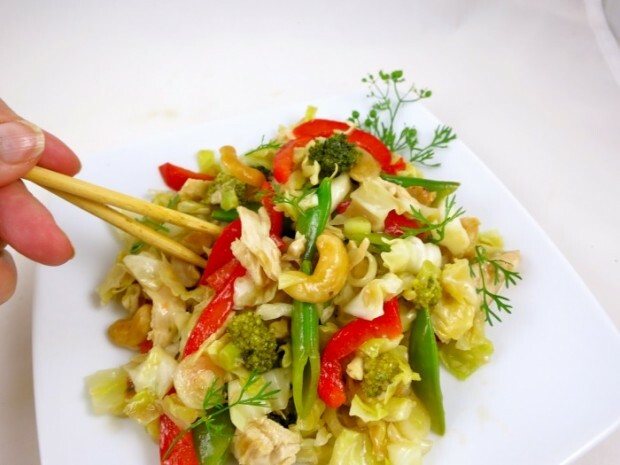 I was delighted when a friend, Linda Cole (known locally as the go-to woman when you’re looking for a healthy and delectable crowd-pleasing recipe), brought the components of this Crunchy Asian Cabbage & Chicken Salad to a recent potluck. Dumping the individual salad components she’d brought to the party into a bowl, she tossed them with the dressing right before serving. This salad would be the ideal solution if you’re looking for totable recipes for autumn tailgates and potucks. You could substitute any cabbage varietal for the savoy cabbage Linda chose, but I appreciated her selection. Savoy has beautiful crinkly leaves, the outer moss-colored leaves encasing tight bound leaves of a celery color. To my palate, it has a sweeter, milder flavor than some of its other cousins, perfect served uncooked in salads such as this. To save time, purchase then remove meat from a rotisserie chicken; chop. Linda also recommends Cardini’s Roasted Sesame Asian Dressing, which you may purchase at Busch’s and other area groceries, as a good substitute for the dressing. I followed Linda’s recipe also using Savoy cabbage. 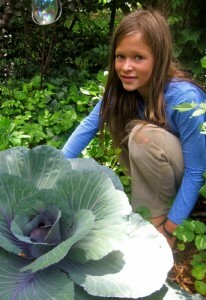 It’s not growing in my garden, but I couldn’t bear sacrificing one of my showy cabbages for the recipe. If, heaven forbid, this winter follows last year’s mild season, in the spirit of Dostoevsky, I will be harvesting the cabbages after the holidays. To make the dressing (recipe below), whisk together soy sauce, vinegar, peanut butter, sugar, garlic, canola and sesame oils. Thoroughly combine. Slowly add dressing to salad to taste, adding kosher salt to taste, if desired. Serve.